It's so hot here in Japan now! Cicadas are shrilling cheerfully everyday. I like summer nights. The air reminds me of my childhood. I can hear the insects' songs that is different from daytime. "Hyoukin na Doyoubi wa Nani shiteru? (What are you doing on funny Saturday?)" It's perfect for summer nights! This song is included in the album "Siesta in Coconuts Island". New video! Yuki's shaved ice shop! 「いらっしゃいませ〜！」　"Thank you for coming!" 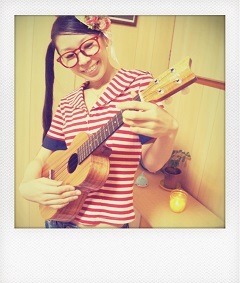 I sang "Aloha Lei" / Agnes Lum. Actually this song was composed by Yuzo Kayama. Please take a rest with the shaved ice and take care of yourself!